Fry: Is that what I think it is? Fry’s Mom: Yep, your favorite. 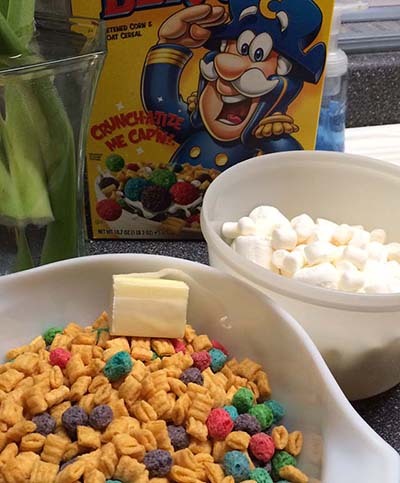 Captain Crunch casserole. Fry: Aw, it’s been a thousand years since I had this! A few months ago, I decided to tackle a Fry family favorite, Captain Crunch Casserole. Even though it’s fawned over in season seven, it’s not clear what the casserole is made from, other than, of course, Cap’n Crunch cereal. I couldn’t decide between two separate recipes, so I figured that I’d just make ‘em both. Comparing the two, I’d guess that the dessert featured in Game of Tones was more like the first recipe I made, but this one was pretty simple and well worth the try, I think. This recipe is very similar to the classic Rice Krispies treat recipe, except that I am substituting Cap’n Crunch Berries for Rice Krispies. The two cereals are quite different, and thus they cook a bit differently. 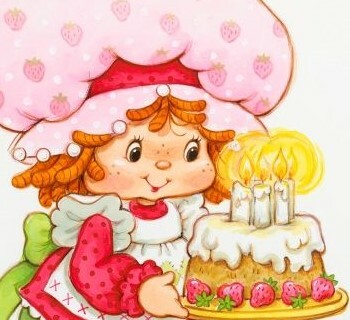 In a large saucepan, melt butter, stirring to prevent burning, on stovetop over low heat. Add marshmallows and stir until completely melted. Add Cap’n Crunch and stir until well coated. Scoop mixture into buttered dish or pan. Press into even shape. After cooling, cut into squares and serve. 6/10 Delivery Boys. Cap’n Crunch has been known to cut the roof of a mouth or two in its day, and once these treats hardened, I expected the bloodletting to begin. 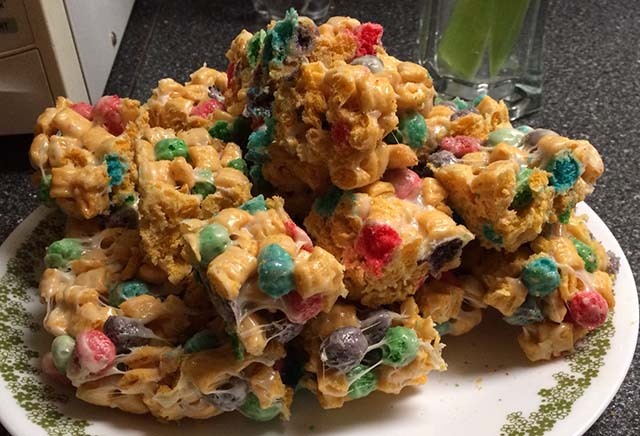 However, they were softer and more edible than I expected, and they looked a hell of lot more festive than the previous casserole recipe, where the crunch berries browned in the oven. This recipe was also extremely easy to make, from preparation to cleanup. Still, it’s just sweeter Cap’n Crunch in bar form. While it didn’t really do it for me, I can imagine that others might enjoy it. If nothing else, it’s something colorful and different to make for an office X-Mas party. Futurama actually has many interesting choices in cereal, including Purpleberry Puffs, from the episode Saturday Morning Fun Pit (season 7, episode 19). 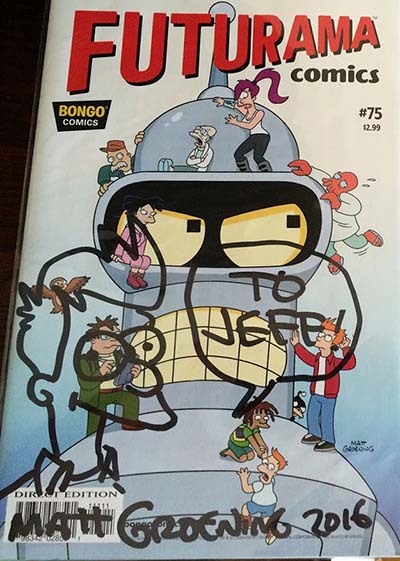 My annual trip to Comic-Con was once again full of Futurama and Simpsons sightings. 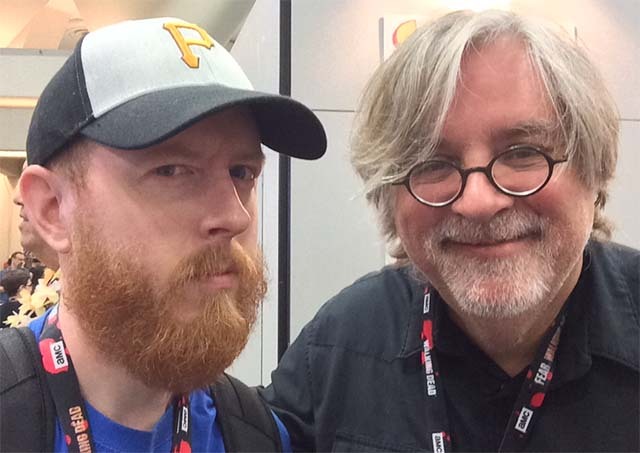 First, and this was as exciting as it sounds, I got to meet Matt Groening. I also managed to get some Bart Bucks from the Bongo Comics booth…which I then traded in for a sketch by Groening himself. 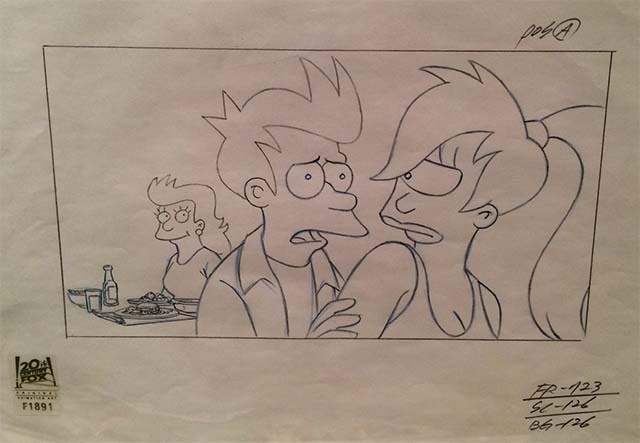 And lastly, I made a hefty purchase and bought my very first piece of Futurama production art. 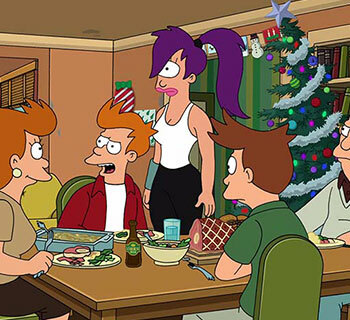 This production drawing had just what I was looking for: both Fry and Leela, talking to each other in front of some Captain Crunch casserole. That’s Mrs. Fry in the background, from the very episode that spawned this recipe: Game of Tones! I figured that it was fate when I saw it. 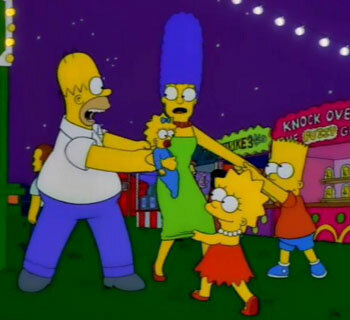 The casserole dish is just visible in this scene, but hey, it counts. Ed’s Note: You might notice this post talks about Comic-Con, an event that happened roughly 8 months ago. It didn’t actually take Jeff this long to write about that event, it just took me this long to post due to a clerical error. You know what I blame this on the breakdown of? Society.